Me painting at Lovebox with Miss Lippy in 2015. Glitter glitter glitter – is it just me or have the internet, festivals & the world gone absolutely glitter mad over the last year? 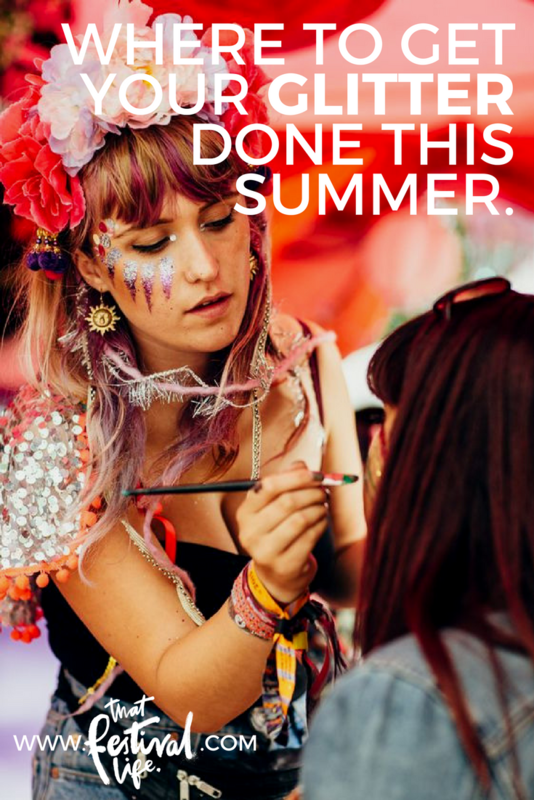 I’ve spent four years professionally decorating peoples faces since Secret Garden Party back in 2014 and that year there were only a couple of different stalls doing it and we were hunting the depths of the internet for our stock. Since then it has exploded with a plethora of specialist shops online and even high-street shops stocking the most sparkly blends as well as more fads, from glitter roots to glitter butts, than you can shake your glitter brush at! Gone are the times when you were the most most (or least) popular person on the campsite for having a bit of the sparkly stuff to spread around. It’s no longer just a case of popping a bit of vaseline and some cheap craft glitter in your pocket… sparkle standards are high with only iridescent glitter and shards in different textures, bindis, metallic tattoos and a plethora of otherworldly gems being used to make the looks this season. All the artists who created these looks can be found in my round-up below! If you want someone to do the hard work for you then I’ve got you covered, here’s a selection of my favourite festival glitter artists … look out for them in the fields this summer. Original glitter badman Helen Sian Lewis and her crew of artists have been doing this since day… You can spot her trademark glitter paint splash style from a mile off. You may have visited her in the Boo-dior at Glastonbury or Love Saves the Day but look out for her at Secret Garden Party & Shambala too. My friend Terri and mega talented gang. They favour bright neon colour pops for a fresh glitter look, they’ve even recently gone eco & vegan friendly and are only using biodegradable, cruelty free stuff from now on. Give their facebook page a like for a healthy dose of art & girl powaaaa! 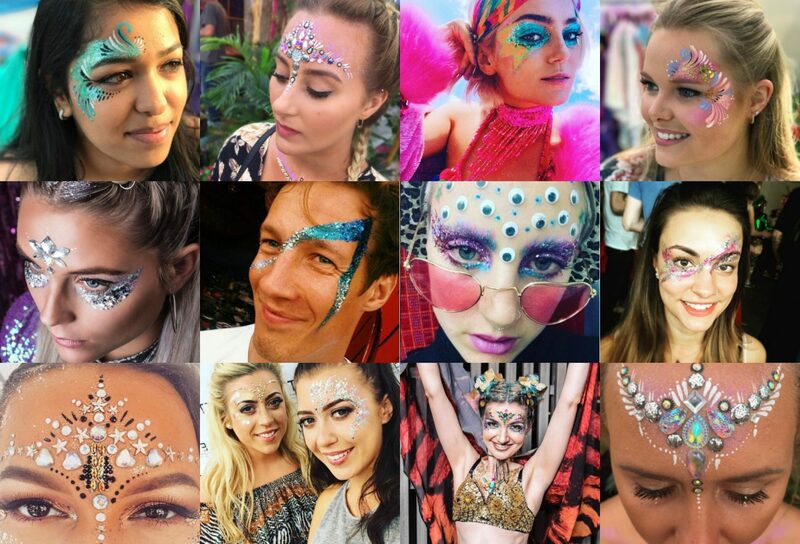 Bindi queens In Your Dreams These girls are donning instagram at the moment with their team of professional make up artists from across the UK and Ibiza. 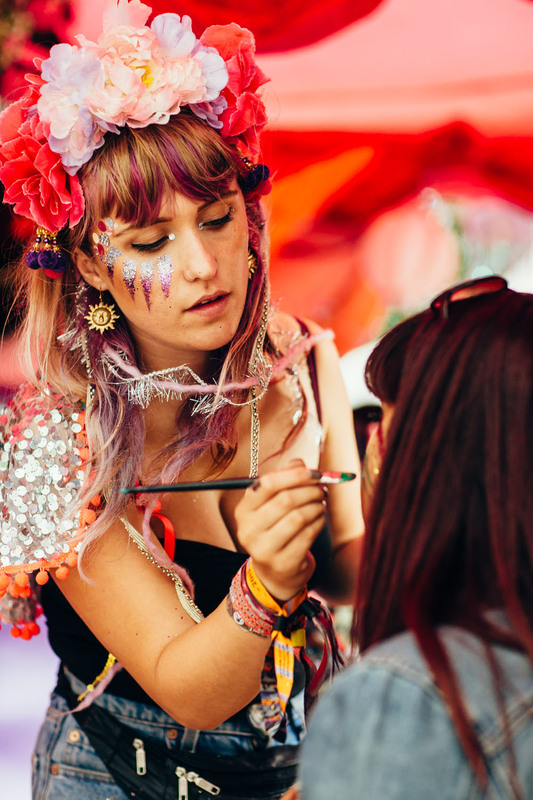 look out for their luxo parlour at festivals this summer for face embellishments galore. I’ve worked with these wonderful ladies over a number of events – bringing my trademark turquoise glitter eyebrows to the party. Find them at lovebox, wireless, or deep in the labyrinth at Secret Garden Party… just look for the lips! Intergalactic vibezzzz at the labyrinth #secretgardenparty come find us!!!! #GLITTER!!!! 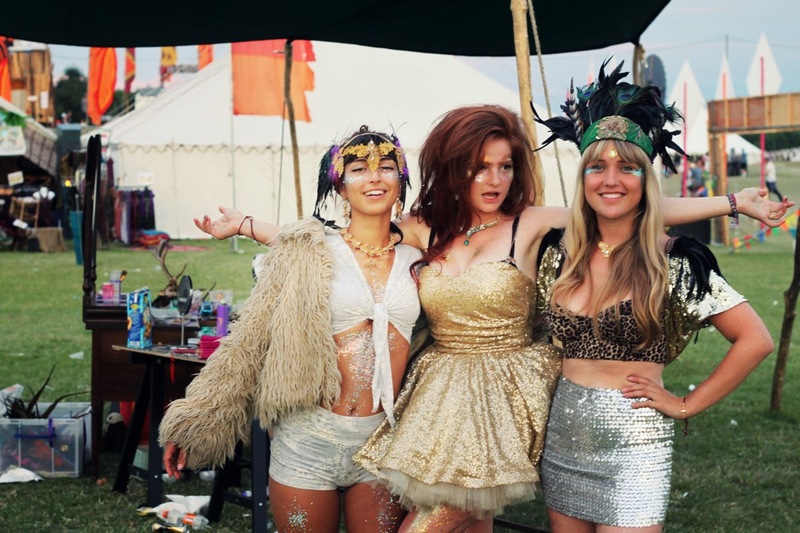 I first spotted these chicks at the Burnt Soul end of season pop up last year and got some SERIOUS gem envy, as well as doing make-up themselves they have a shop where they sell their divine glitter mixes by the pot. My main gang… The Fashpack is run by Joh and Amy who have been painting and glittering at festivals like Shambala and across Bristol club nights for years. We’ll do everything from the most ornate face apint to the silliest of glitter ‘taches find our emporium at Shambala next month! Check out some of the faces I did with Joh at the FESTJUMBLE market. 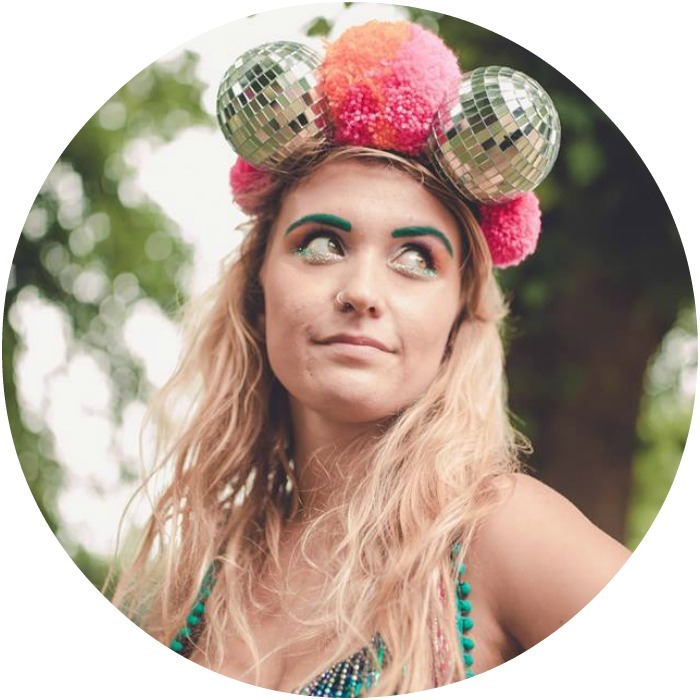 As well as working with the The Fashpack I also run my own crew… The Glitter Gang are available for events, festivals, hen do’s, children’s parties… if you need a bit of sparkle in your life Contact The Glitter Gang for rates. Who are your favourite glitterers and who have you checked out this summer? Let me know in the comments below! Featured image and top image are me with Miss Lippy at Lovebox in 2015 – wearing floral crown by Gypsy East, sequins by Capes Capes Capes & earrings by Tezla Designs. How much do the glitter artists charge at festivals? Trying to work out whether it’s cheaper to do it myself or not.